"Dr. Kacmar is the best doctor I have ever had. He goes the extra mile for your care." "Dr. Kamar is the most dedicated and thorough doctor, by far the best doctor I've had." "I like and trust him more than most of the other doctors I've gone to over the years." "Great doctor. Very compassionate. Truly cares about his patients. Highly recommended!" " I wholeheartedly recommend Dr. Kacmar and his office. You won't find a better doctor." "I couldn't recommend another practice more! BIG thank you to everyone there." Dr. Kacmar is a family physician who is board-certified in both primary care and in sports medicine. A former athlete (collegiate football), Dr. Kacmar recognizes the value of preventing and treating sports injuries in the context of primary care. Dr. Kacmar attended Indiana University School of Medicine and completed his residency in family medicine at West Suburban Hospital in Oak Park, Illinois. After completing a fellowship in sports medicine at Lutheran General Hospital in Park Ridge, Illinois, he worked in various settings, including family medicine, sports medicine, and as the medical director for physical therapy and outpatient rehabilitation. Today, he is the medical director for the Center for Primary Care and Sports Medicine, and he holds a teaching affiliation with Loyola University Chicago - Strict School of Medicine and Aurora University. He is the team physician for all collegiate athletes at Aurora University. He remains active in the sports world, providing medical coverage for professional, high school club, and team athletes. He also coaches in local soccer leagues and lectures on both preventive and sports medicine. 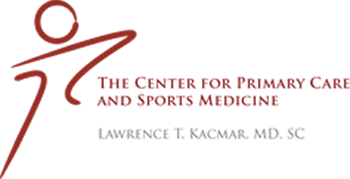 As a recipient of the 2016 Opencare Patient's Choice Award, Dr. Kacmar and The Center for Primary Care and Sports Medicine was recognized as one of Chicagoland’s best clinic's based on the reviews of our patients. Thank you to all of our incredible patients and visitors who took part in helping us achieve this incredible award! "Dr. Kacmar and his staff are fabulous. He is easy to talk to, and is incredibly thorough in his approach to diagnosing the problem. You won't find a better doctor." "The most important thing about seeing physician is communication. Dr. Kacmar is the best. He has excellent bedside manner - never judgmental or pretentious." "Dr. Kacmar is attentive & doesn't rush your visit like so many other doctors do. I like and trust him more than most of the other doctors I've gone to over the years."